Posted on Wed, Mar 7, 2012 : 5:58 a.m.
Site plans have been submitted to the city of Ann Arbor to construct a new parking lot behind a shopping center on Washtenaw Avenue and Chalmers Drive, intended for the center’s employees and Ann Arbor Transportation Authority Park & Ride users. 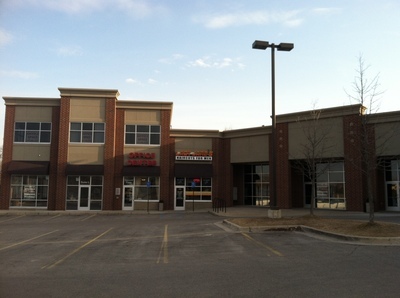 Businesses in the Chalmers Place retail center, which is located west of Arborland, include The Vitamin Shoppe, Jimmy John’s, Verizon Wireless, LUV Manicures & Pedicures and Lady Jane’s Haircuts for Men. But the center is nearly 50 percent vacant, and the owner cites parking as the main issue with attracting new tenants. A portion of the Chalmers Place retail center, which is located on Washtenaw Avenue and Chalmers Drive in Ann Arbor. “The current parking lot is inadequate to serve the development, which is 50 percent vacant, making it nearly impossible to lease the remaining 50 percent of the retail center,” according to the plans. The center - which is owned by Len Nadolski and managed by Kevin Travers - has 88 parking spaces, 44 to 74 of which are used by employees of the center’s retail stores at any given time. To free up some parking out front, Nadolski wants to rezone a parcel directly behind the retail center from R1B, Single-Family Residential, to P, Parking, and construct a 43-space parking lot. Access to the new lot will be provided through the existing curb cut on Chalmers Drive. After holding a citizens participation meeting for the project in January, the plans have been amended to reflect neighbors’ concerns. Plans now include installing security cameras to limit loitering on the new lot, mounting lights low on poles so no light is shed on neighboring properties, limiting the hours of the lot to business hours, and not adding additional vehicular access points or curb cuts. “We have worked tirelessly to inform neighboring properties of the project intent and listened to their concerns and effectively addressed their concerns,” according to the plans. There would also be a screen fence and landscaping around the new parking lot that would make it “invisible” from neighboring properties. The plans call for a portion of the parking lot to be used for commuters to access the AATA bus service, which has a stop adjacent to the retail center on Washtenaw Avenue. It is yet to be determined how many spaces would be available for Park & Ride users. “The AATA is working to provide Park & Ride opportunities in a number of existing parking lots along Washtenaw Avenue between Ypsilanti and Ann Arbor, with the goal of providing 150-200 commuter parking spaces,” said Chris White, manger of service development for the AATA, in a note to the retail center’s manager. Matt Berke of Southfield-based The Beale Group Inc. is marketing the vacant spaces in Chalmers Place. There are several first-floor storefronts available and some second-floor office space. Thu, Mar 8, 2012 : 5:36 p.m. I moved here 10 years ago with the promise that a PARK would be built for the young families in the new neighborhood. How silly of me to trust in the builder and city government to keep their promise. Traffic on Washtenaw needs to be addressed before any more businesses are approved! The road cannot handle the number of cars as it is. Parking should have been considered also-before, not after the fact. Turning left on Washtenaw from Chalmers Rd or any business on that side is dangerous. Bad planning! Stop making it worse! And stop blaming the neighbors who want peace and quiet and had nothing to do with the bad decisions from years ago! Thu, Mar 8, 2012 : 8:33 a.m. I don't like the flow diagram, seems too small an area for buses. What happened too the Arborland site, too crowded as well I guess. I have trouble going too MacDonald's as well. I get Indigestion, its too expensive, &amp; I see the food as unhealthy. Thu, Mar 8, 2012 : 11:35 a.m.
Thu, Mar 8, 2012 : 8:37 a.m.
Looks like I'm 'too' trigger happy. Wed, Mar 7, 2012 : 10:06 p.m.
Huh, guess i might not be able to go Salamander watching behind there anymore. Just remember Chalmer residents, it was over 20 years ago that the prison system tried to put a half way house right on that corner. Very near a school. Boy did they get up in arms over that. It was that that changed their minds about putting one there. Whew. Otherwise, most employees would get better security by parking in back as well. Good luck over there. What a mess. Wed, Mar 7, 2012 : 6:55 p.m. They should pay to have Chalmers Rd paved. It's ridiculous that the city and the county point fingers at each other about who should take care of that pothole stricken road. Wed, Mar 7, 2012 : 3:46 p.m. I wonder if the lack of sufficient parking is the result of poor planning by the owners/builders or one of the compromise hoops they were forced to jump through by some level of city bureaucracy. Wed, Mar 7, 2012 : 3 p.m. Wed, Mar 7, 2012 : 10:09 p.m. They are very well indeed pro AATA. Can you blame them? Can't understand the neighbors. Most people on this site favor more parking in Ann Arbor, always complaining about how difficult it is to find a spot. The neighbors should be happy to have a parking lot right next to their place. Then they can park, get off their car, can get in their car, drive in a circle and park again as often as they want. Wed, Mar 7, 2012 : 1:44 p.m. Wed, Mar 7, 2012 : 1:30 p.m.
Will AATA be paying for some of the construction costs or do they lease parking for their Park &amp; Ride customers? As a person who frequents this mini-mall, the parking provided is inadequate and almost dangerous! The Jimmy Johns cars drive around constantly awaiting deliveries and stop in front of the stores often which creates traffic jams. There's barely room to get into most of the spots anyhow and with the JJ cars circling it's horrible. The lot was certainly poorly planned and then to approve a food delivery store in the mall was unwise. That said, it all now exists as it is ..... so I am hoping that back lot gets approved. Wed, Mar 7, 2012 : 1:22 p.m. I'd say that the vacancies exist because (1) it is hard to get in/out of the &quot;mall-let&quot;; (2) parking is limited; (3) there are plenty of other properties along Washtenaw available; Adding an additional lot without adding a traffic light is not going to help - in my opinion; And adding a new light may not be a good idea anyway; If the property is available then perhaps an alternative is a service road from the back of Arborland to the &quot;new&quot; lot; I'm not convinced that is a good idea, but it is an alternative (if the property is available); Remember an entire new &quot;mall&quot; is going to be developed across from the whole foods / barnes-noble complex in the near future - with probably (who knows) better access and more parking. Wed, Mar 7, 2012 : 1:05 p.m.
Re: &quot;I find it hard to go to McDonalds...&quot; Well, that's one vote for the status quo. Thu, Mar 8, 2012 : 11:33 a.m.
Arieswoman: hmsp was referring to the McDs reference. people, pls don't eat fast food. c'mon. fast food is as cool &amp; healthy as ciggs. funny how no one is claiming it's 'difficult' to go to the Vitamin Shoppe. . .THAT is what he meant by 'status quo'. Wed, Mar 7, 2012 : 1:27 p.m. I never meant &quot;status quo&quot;. I feel that poor planning in this area for cars coming and going to businesses. That pretty much goes for much of Washtenaw with poor planning over the years. Wed, Mar 7, 2012 : 12:41 p.m. Wed, Mar 7, 2012 : 12:35 p.m. I wonder how the people in the home behind them on Chalmers would feel about a parking lot next to them. It probably would not help their property values. Wed, Mar 7, 2012 : 3:25 p.m.
&quot;...sorry too bad&quot; is certainly one option, and knowing Ann Arbor the likely option. But if IF its true that the 50% vacancy rate is due to insufficient parking (poor planning or not) I'm inclined to see the parking lot as a greater good with a minimal downside. If it were a different location I might not see it that way. But again those houses are surrounded on 3 sides by &quot;city stuff&quot;. So that is where my sympathy for the homeowner is mitigated. Wed, Mar 7, 2012 : 1:56 p.m. Yes, but now it is zoned residential and I would imagine that property owner has/had a reasonable expectation that they would not be looking at a parking lot next to their home with all of the inherent traffic of cars and people coming and going. Now it looks to be a nice green wooded space. The shopping center, and the city should have considered parking when they developed. I would say, sorry, too bad. Wed, Mar 7, 2012 : 1:31 p.m. I see your point but realistically that house is a &quot;half block&quot; off a major road and a par 3 from Arbor Land Mall. So I'm not sure in the big scheme how much that lot would impact the next potential buyer. Plus at some point maintaining a little &quot;oasis&quot; in the midst of town becomes problematic. Especially when your oasis involves somebody else's property. Wed, Mar 7, 2012 : 11:42 a.m. This shopping site is difficult to get in and out of due to heavy traffic. It is also true of all the businesses along that strip of Washtenaw. I find it hard to go to McDonald's also. Wed, Mar 7, 2012 : 4:01 p.m. Okay 30 plus years in Ann Arbor, thousands of days driving on Washtenaw. I have never had to wait an extended time to get into this or any lot in that area. I find that many drivers are courteous enough to stop and allow me to enter lots when traffic stops for traffic signals. As I read your post, I could hear violins playing sad music in the background. Patience is a virtue. Wed, Mar 7, 2012 : 1:23 p.m. Living in the area I have developed the mindset to avoid left hand turns at busy times in the area. I just do what it takes to make right hand turns in to and out of those area businesses. I may not actually save any time...but as long as I think I do ignorance is bliss.